A two-year study found doctors designed and participated in torture and inhumane treatment of prisoners at CIA and Pentagon-run prisons. DOCTORS AND NURSES tasked with monitoring the health of terrorism suspects were complicit in abuses committed at prisons run by the Pentagon and the CIA, an independent report has found. The US Defence Department and the CIA demanded that the health care personnel “collaborate in intelligence gathering and security practices in a way that inflicted severe harm on detainees in US custody,” according to the two-year study by the Institute of Medicine and the George Soros-funded Open Society Foundations. Medical professionals helped design, enable and participated in “torture and cruel, inhumane and degrading treatment” of detainees, according to the report. 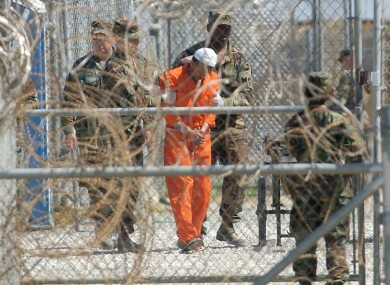 Collaboration at US prisons in Afghanistan, Guantanamo and the Central Intelligence Agency secret detention sites began after the terror attacks on 11 September 2001 in the United States. “It’s clear that in the name of national security, the military trumped (the Hippocratic Oath), and physicians were transformed into agents of the military and performed acts that were contrary to medical ethics and practice,” said study co-author Gerald Thomson, professor of medicine emeritus at Columbia University. The Hippocratic Oath is a committment made by medical personnel to practice their profession in an honest and ethical manner. The report, conducted by two dozen military, ethics, medical, public health and legal experts, calls on the US Senate Intelligence Committee to fully investigate medical practices at the detention sites. Co-author Leonard Rubenstein of Johns Hopkins University focused on force-feeding on Guantanamo Bay’s hunger strikers, as well as CIA agents’ use of harsh interrogation methods and simulated drowning known as waterboarding at secret sites. “Abuse of detainees and health professional participation in this practice is not behind us as a country,” he told AFP. The authors also urged the Pentagon and CIA to follow standards of conduct that would let medical personnel adhere to their ethical principles so they could later heal detainees they encounter. Both the CIA and the Pentagon rejected the report’s findings. The report “contains serious inaccuracies and erroneous conclusions,” said CIA public affairs chief Dean Boyd. “It’s important to underscore that the CIA does not have any detainees in its custody and President Barack Obama terminated the Rendition, Detention and Interrogation Programme by executive order in 2009,” Boyd said. Obama signed an executive order shortly after taking office in 2009 that banned interrogation techniques used under his predecessor George W Bush and that critics say amount to torture. Although the president has not banned extraordinary rendition, new rules prevent suspects from being tortured before they are transferred to a different country for interrogation, trial or continued detention. Obama also established a task force to review interrogation and transfer policies and issue recommendations, but the group’s 2009 report remains classified. At the Pentagon, spokesman Todd Breasseale said that none of the critics of prisoner care “have had actual access to the detainees, their medical records,” or the procedures at the Guantanamo detention camp. The doctors and nurses “routinely provide not only better medical care than any of these detainees have ever known, but care on par with the very best of the global medical profession,” he said. Allegations of medical personnel complicit in abuses are not new: in 2009, the group Physicians for Human Rights said that doctors were directed to monitor the CIA’s interrogation techniques in an effort to improve their effectiveness. The group said the practice amounted to “unlawful experimentation” on detainees treated as human subjects. Email “Doctors and nurses 'complicit' in US torture of terrorism suspects”. Feedback on “Doctors and nurses 'complicit' in US torture of terrorism suspects”.